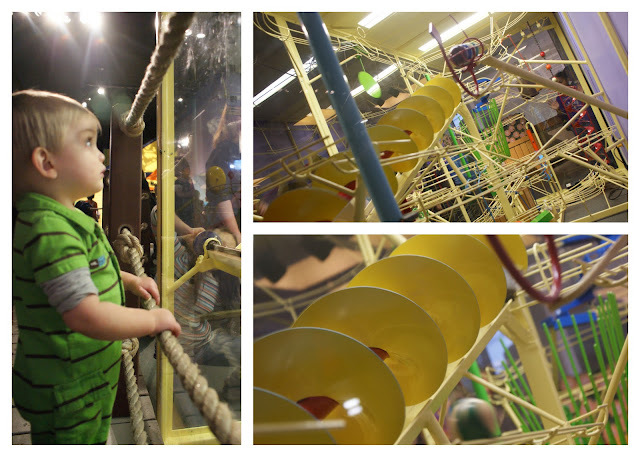 We have been itching for a long time to get back to the world's largest Children's Museum. About a year ago we decided to get a zoo pass, so our museum membership has lapsed. But the kids got money for Christmas from my parents to buy a new membership. Our school was dismissed for Presidents Day, so we jumped at the chance to make the trip to Indy to one of our very favorite places. It happened to be a free day, which didn't matter a whole lot to us. We just decided to buy our membership next time we go to extend the expiration date. Well...free day is definitely a whole different museum experience than what we're used to. The crowd was ENORMOUS. It was a very cold, very rainy day. I was chagrined to see that the garage was completely full and we passed up street lot after street lot until we finally were directed into the lot farthest away from the museum. After shivering and shaking through the rain and puddles, we made our way into the unbelievable crowds in the museum. But we still had a fantastic time. I absolutely love how the museum grows with us. It just doesn't get old, because there is always a new level of discovery to find. We all loved seeing Corin experience it at the toddler instead of crawler stage. Corin (19 months old) climbed and climbed. He got a little freaked out at some little puppets in the tree house, but he got beyond it and plowed on! On a developmental note, I am happy with his attention span - his ability to stay with an activity for quite some time kept me from having to run around behind him like a crazy lady. I think I was actually usually the one to suggest a new activity. And this time, more than ever before, I was able to let the older 3 kids explore on their own within a room without constantly freaking out over their location. I trust them all now to stay in the room where we are, even if they think they've lost me. So I could concentrate on being with Corin while they each played at their own pace. One of our favorite rooms (I think they're all our favorite...) is the Biotechnology Learning Center. Kayla-girl is so totally in her element in there. It makes my mommy-heart so happy to see her engrossed in science discovery. 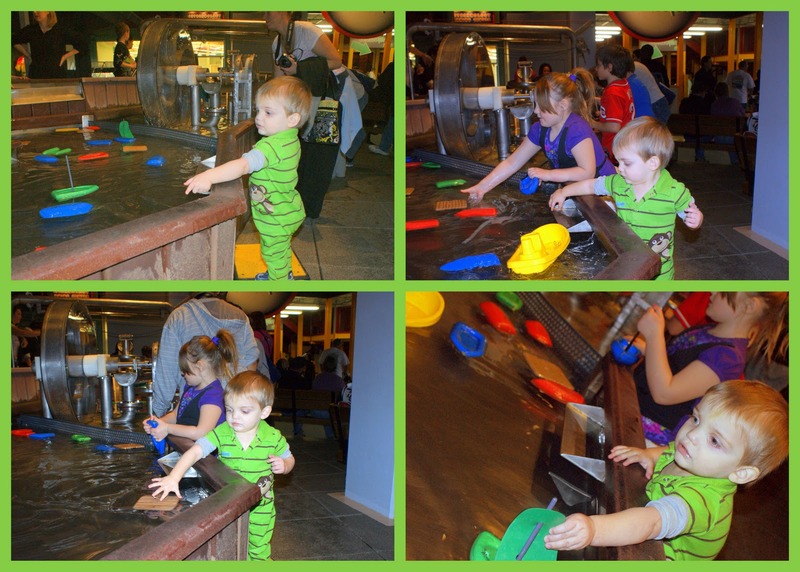 We usually do their scheduled learning activities, but because of the free-day crowds, they had a free discovery day. There were specimens on the tables of various objects and there were journals for recording observations, etc. She spent probably 45min to an hour in there alone, observing specimens and studying the human body and making observation journals. It was awesome. If you do go to the museum, there is an awesome program we didn't know about at first. It's called the Science Club. You pick up a club card for each kid at the Dinosphere or other science location. Go up to a museum worker and ask what you need to to do get your card signed. You just have to ask a question or participate in an activity to get your card stamped. When you get 4 stamps, you get a prize. Twice, they all got free meals at the Weber Grill Restaurant! Karissa and Caiden served me a delicious tea at an Egyptian cafe in the Take Me There Egypt exhibit. For some crazy reason, we always wait to take the group picture until the end, when we're all tuckered out. This museum is just awesome. God's world is so amazing, so full of wonder and fun and reasons for worship. This museum gives us a chance to learn and discover and have a blast. It is a huge blessing in our lives. Never a normal picture. Never.